Hon. Prime Minister Hubert Minnis in the House of Assembly. (Governor’s Harbour, Eleuthera, The Bahamas) Chief Immigration Officer for the Eleuthera district, Mrs. Shema Darling has issued a public reminder to anyone on the island who has not received a response concerning their application to come in to see them at the local Immigration Office. This reminder followed recent announcements made by the Hon. 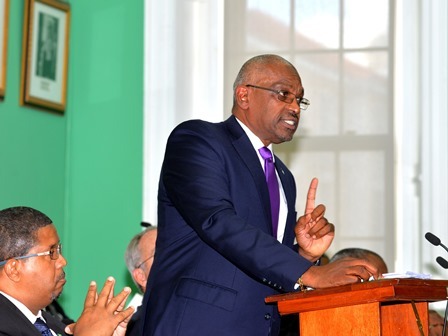 Prime Minister Hubert Minnis in the House of Assembly on Wednesday morning, October 11th, 2017, where he stated that any migrant residing illegally within the Bahamas has until December 31st, 2017 to leave the country. Mrs. Darling confirmed that in addition to the 400 illegal migrants that were taken into custody in Eleuthera during the first nine months of 2017, another three people had been taken into custody and transferred to New Providence for further processing on September 30th, 2017. Two of the illegal migrants, a man and woman, were taken in the Gregory Town area, and the third, another man, was taken into custody in Harbour Island. I advise the House that the Government will continue to address the vexing issue of illegal migration. We will continue to concentrate on the Immigration Department, with particular emphasis on the process for granting and renewing work permits and visas. We will continue to process permanent residency applications for those who have legally been in The Bahamas for an extensive period of time, who have contributed to The Bahamas and satisfy the requirements. This is a fair and just course of action. We must be a country that abides by the rule of law. Those migrants who are here illegally must leave by December 31, 2017. After which period, they will be aggressively pursued and deported. This applies to all nationalities. Those Bahamians and residents who employ illegal migrants have until December 31, 2017, to regularize these individuals or to stop employing them. I implore Immigration Officers to execute their duties in a professional and humane manner.